We waste a lot of time thinking something is owed us. We brood over injury. We are not self-contained. Lent helps us remember the real truth about ourselves and our situation. The wisdom of the saints, like St. Bernard, helps us see our actual situation. His teachings suggest we can be free of brooding and find a new kind of self-possession when we allow the Lord to preoccupy us with his immeasurable love. We are, in fact, loved so much more than we deserve, but we can only see this as God leads us out of ourselves and into Him. For St. Bernard, conversion happens when we allow God's love for us to cause a constantly expanding desire for Him in our hearts. We allow God to stir this growing desire whenever we act on what God's love prompts us to do in our hearts. Growing in love in this way is infallible because God's desire for our conversion never changes. The result is as we desire God more, our freedom to act and to love grows ever stronger. This next statement is a little paradoxical. Our freedom reaches its fullness in mature humility. The paradox resolves itself, at least partially, if we bear in mind the kind of only kind of freedom Bernard believes in - the freedom to love. Mature humility is like a mountain top of self-possession or self containment for St. Bernard. Love demands this kind of self-containment because to really love freely takes the full force of our being. In mature humility, the heart rests content in God's bountiful love. It is a strange contentment because it demands constant vigilance, ongoing conversion. Bernard calls this spiritual warfare. It involves a constant struggle against our former way of life, against the gravitational pull of our big fat egos. Another way he looks at it is that this kind of contentment to be sustained in the Lord must keep vigil against them movements of pride. For those who want to climb to union with God, Bernard teaches that there is one great truth of which we must come to complete acceptance. In his Ladder of Pride, he explains how we constantly work to fully accept God's love for us. This love is not commensurate with anything we think we have done to earn it. The moment we start thinking we are owed something is the exact instant we climb the ladder of pride and fall out of the heights of humility. There are probably a lot of people who think that this is psychologically unhealthy to think about. They would probably conjecture that any awareness one has of being loved more than he deserves is really just poor self-esteem. But humility is the virtue that regulates self-esteem. It is singularly unhealthy to esteem one's self more or less than the truth about who one is. St. Bernard would say that in truth, each of us is uncommonly loved by God, eventhough we have done nothing to deserve such love. We do not know why we are loved in this way. But we are, in all our unworthiness. It is humility to accept this. Paradoxically, progress is made in the spiritual life through the growing awareness of our own unworthiness in the face of God's incalculable love. In the heights of humility, however, we must fight against one uncharitable preoccupation which, while not seeming to be vicious, can uttlerly destroy our ability to learn to love. He calls it curiousity, but what he means seems to be closer to ambition. Biblically, it is the pursuit of "making an name" for oneself. Think of Babel or the history of Israel. The ambition to lord over others and to draw attention to oneself always leads away from God. St. Bernard, pride begins with the way that we look at our brothers and sisters, and it ends in a total rejection of God. His bottomline is that the heights of humility are a protected place as long as we we are humble in our dealings with one another. But the gravity of pride constantly pulls at us and, he explains, this pull can only be resisted through prayer, fasting, and humble acceptance of those trials which come our way. Prayer, fasting and the acceptance of trial helps us realize that our true value is in God's love for us and in his love for those he has entrusted us. Real self-esteem is rooted in this realization. Our lives are meant to co-inhere: to co-inhere in God and to co-inhere in one another. This means the joys and sorrows of God and my brothers and sisters belong to me, are the proper place for my heart to dwell. Preoccupation with making a name for myself takes my heart out of this kind of self-possession. For Bernard, the self does not fully exist isolated from God or from others. The self, the human "I," ought to be in communion with God and others, or it is less than itself. Thus, to be self-contained, means for Bernard, that our only concern has become communion with one another in Christ. An interesting application with the observance of Lent presents itself. Traditionally, Lent is a time of prayer, fasting and almsgiving. In other posts I hope to address the connection of Bernard's insight with Lent's prayer and fasting. Here, just a word on almsgiving which is not unconnected with the importance of bearing the trials that come our way. In giving alms to those in desparate need what we are really doing, according to Bernard's perspective, is containing ourselves in a very small way. Our gift is a kind of sharing in the struggles of our brothers and sisters. Think of the poor plight of those in Chile or Haiti or even the homeless mentally ill on our own streets. Their sufferings are always connected to us because of who they are, and humility, knowing the truth about ourselves and how we are connected to them, does not afford us the luxury of ignoring their plight. Their plight is ours. For St. Bernard, to see it any other way is just pride. Father Ian Ker, a Catholic priest, Oxford scholar and prominent biographer of Cardinal John Henry Newman, will offer a "Newman-esque" interpretation of the Second Vatican Council. Rev. Ker will discuss, from the perspective of Newman’s theological outlook, competing interpretations of the Council, comparing those who see it as a rupture with the Church’s past, against those who see it in continuity with the Church’s 2000+year history. His two most recent books are “The Catholic Revival in English literature 1845-1961” and “Mere Catholicism.” His biography of Newman, originally published in 1988, was reissued by Oxford University Press in 2009. He has also recently completed the first full-length intellectual and literary biography of G. K. Chesterton. Mercy is love that suffers the weakness of the beloved. It bears an offense to affirm the dignity of the offender. Divine mercy is God's loving presence, dwelling in the abyss of our own misery. He reveals how much He suffers with us whenever we behold the Christ crucified. This is a mystery every Christian must experience. It is especially attached to the priesthood in the tension between the greatness of the ministry and the unworthiness of the minister. This post is the fourth and final part of a lecture given on the priesthood. It attempts to highlight the importance of praying for priests in this Year For the Priest. Graham Greene's work the Power and the Glory presents a priest who helps us understand a dimension of the priestly witness of St. John Vianney. Graham Greene's whiskey priest is a very different man than St. John Vianney, and not just on the level of sobriety. The whiskey priest is fleeing for his life during the Mexican persecution of the Church in the 1920s. He is an unlikely martyr struggling with insobriety and self-absorption with a record of infidelity to his priestly promises. His ministry seems completely futile. Yet, he cannot help himself from being a priest. He knows that he is a weak and petty man. In fact, he is too weak to flee for his life. He wants to escape. He could apostatize like one of his friends - but he sees his friend's tormented existence and he knows he is not strong enough to bear it. So he is driven to put his life on the line so that people can have the mass and confession: not by courage or piety, but by a certain sense of duty he cannot refuse. It is concerning this combination of a sense of duty and feeling of unworthiness that we can draw a connection with the Curé d'Ars. John Vianney had no more of a sense of progressing in holiness than does the character created by Graham Greene. In fact, he felt that something about the priesthood was endangering him. The priestly ministry thrust him into a place where he was so concentrated on the salvation of others, he felt as if he were neglecting his own. This anxiety over death -- death in this life or death in the life to come -- is a common experience for all those who follow Christ. We have an instinct for self-preservation which constantly balks at carrying the Cross. It is the love of God in us that helps us order this instinct for his glory. It is possible to follow Christ crucified in this way, not because of personal greatness or worthiness, but because of God's grace alone, the gift of his life that flows from the cross. In the case of the priesthood, fidelity to serving Christ in his people, even when he is barely recognizable, is the Cup of the Covenant, the pathway to the place of crucifixion. The priest can follow this pathway because of a gift he received in Holy Orders. It is the grace of Christ, the very life of the Risen Lord, given in this sacrament that drives the priest - even if he does not know it. If he tries to deny it, it will not leave him in peace. This is because grace, in particular the grace of Holy Orders, comes in the form of love, and only by surrendering in love do we ever find the rest for which our hearts long. This sheds some light on why the Year for the Priest is also a time to pray for priests who struggle with the priesthood. The Lord desires them to rest in his love. And yet some of them are tormented like Graham Greene's characters or like the Curé d'Ars on those occasions when he left his parish. On the one side there is the call to love God's people that lives in the hearts of the ordained. On the other, there is anxiety, some form of fear that makes a man want to runaway. It is in the cross section of these two movements that the Lord chooses to dwell with us, where he discloses the power of his mercy. As the brothers and sisters of those the Lord allows to dwell in this holy place, we must pray for them, that they might discover the embrace of the mercy of the Father. In this post, we will try to bring into relief important aspects of Mystery of the Priesthood as witnessed by St. John Vianney through comparing his experience with a priest depicted by Miguel de Unamuno. We hope to show the essential connection between the truth of the faith and the nature of the priesthood, and the fruitful tension between the truth about the man who is a priest and the truth about the priesthood given to the man. Before we can begin this comparison, we need to make some initial observations. First of all, the priestly ministry is often viewed as a cultural convention imposed from the outside to which a man must submit if he is to be a good priest. The Catholic Church however asserts that the priesthood is not the product of human culture, but something given by God. Now these two ways of seeing the priesthood play themselves out historically and culturally. For those who do not believe in God or that God can give a gift like the priesthood, it is completely baffling that the priesthood or religion should demand so much. For those who begin to understand what the Lord has given us in the priesthood, they can not believe that God would be so generous. Another point to bear in mind is the intrinsic nature of divine gift of the priesthood. The Catholic priesthood is not extrinsic to humanity, but takes up and perfects something God has already planted in our nature. God created men and women with a priestly character - that is as his image and likeness the highest form of human activity is to enter into the rest of the Lord through worshipping Him. Much more could be said on this point, but for our purposes it is enough to assert that the priesthood of Christ takes up this priestly quality of our humanity, restores it to is full dignity and perfects it. Another preliminary point to be made concerns the relationship of Christians to those ordained into the priesthood by the sacrament of Holy Orders. Christ's priesthood is something every Christian recieves at baptism. In a certain sense, every Christian is a priest - part of a nation of priests. By baptism, we offer acceptable worship to the Father through Christ Jesus for the salvation of the world. But the way Christ established his Church, the baptized cannot do this by themselves. They need to be lead by someone with the special authority of Christ which comes through the apostles. It is from among the members of Christ priesthood that some are selected by the bishops or successors of the apostles to lead, teach and sanctify the rest of Christ's body. To say that they are ordained means that they are given the Sacrament of Holy Orders - a sacrament of service that gives these men special grace to serve all those who are joined to the royal priesthood of Christ. When we speak of the Catholic priesthood, it is these ordained ministers of Christ's body to whom we are referring. One final point that is essential for our conversation is what happens to someone who is ordained in Holy Orders for the priesthood. The ministerial priesthood is conferred through Holy Orders. When the bishop imposes his hands and consecrates a man to the servcie of God, the very heart of the man is changed. A new intrinsic power now flows from the Cross of Christ through him in a manner the Christ power has never flowed through his person before. Traditionally, we call this divine change of heart sacramental "character". The priestly character conferred in Holy Orders configures a man to Christ in such a way that he is able to signify the sanctifying power of Christ every time he is faithful to his ministry, even in the midst of weakness and failure. For this power to be revealed, all it takes is faith. But now we get to the point of our refection, an existential question that many struggle with - is the power of faith really rooted in reality or is it merely psychological, the power of suggestion that moves emotions and imagination? The personal answer to the question has grave consequences for the way we approach our faith and our salvation. For many people today, faith is something sentimental, a nice idea we return to when life gets too hard. When I worked in a parish some parishioners would get so upset with the Church whenever an appeal was made to an absolute value - like the sanctity of life or the indissolubility of marriage. They expected their faith to make them feel better about certain bad decisions, but the truth of the faith they had to deal with was not very consoling. But the truth rarely consoles at first. It challenges us. It makes us rethink what we have done. Time and again in my own life I have had the painful discovery that what I want is not the measure of truth, the truth is the measure of what I want. And, only after we have dealt with the truth do we begin to find a consolation that nothing else in the world can give. The truth about the priesthood is part of this. And the odd thing about reality is that it refuses to limit itself to what we expect it to be. What is real never really fits into the categories we construct for it. In the end, we accept it for what it is - or live in a delusion. Similarly, only those who accept the priestly ministry for what it actually is discover the truth about it, and this truth can make all the difference in life. To shed light on the essential connection between the truth of the faith and the nature of the priesthood, we will consider Unamuno's priest in his short story Saint Emmanuel the Good, Martyr. He depicts a preist driven by compassion for his village community in 19th Century Spain. His heart aches because of the looming reality of death and the lake of despair it occasions. Out of this compassion, Unamuno's priest promotes the Catholic faith. The problem is that for this priest, on a personal level, the faith is no more than a pious myth, a kind of sacred story for regular people to believe so they can face death with some kind of hope. In Unamuno's world, the truth is something so dreadful that "simple people could not live with it." For me, this depiction is especially sad because it captures something many people, and maybe some priests themselves, actually believe. Namely, the truth about life really is too hard and terrifying, and we need to avoid it if we are going get through it at all. For such people, religion or religious myth is a way to cope with pain so bitter that it simply can not be dealt with straight up. Now if all religion were only myth, than life really would be a sad affair. But not all religion claims to be myth. In fact, the Christian faith as it has been preserved in the Catholic Church, claims to be the fullness of the truth. When the Church claims that Christ Jesus saves us from sin and death, it is declaring that real salvation exists, that life does not have to be a sad affair, that everything that is good, noble and true about humanity does not need to perish. If the Church invites men and woman to believe in Jesus Christ as the Son of God risen from the dead, it is because it is really true that those who believe in Him will not perish, but live forever. The biggest difference between my own experiences and those Unamuno presents is most people who live a religious charade usually do not get much of a happy ending, even the romantic ending he provides. The despair behind the myth they peddle consumes them and always hurts those closest to them. To understand the priesthood and experiences like St. John Vianney had, the starting place is to accept the proposition that Christianity is not a myth, but the stark and surprising truth. If we look at all the evil in the world, it truly is surprising that God really did create us and really does yearn for friendship with us. His desire is so great that the Father sent his only begotten Son to become one of us so that we might be able to join in the very love life of the Trinity, leading all creation into worship and praise. This truth is also stark. To make it possible for us to choose this friendship we needed to be freed from sin and death - and for this reason Jesus, the Son of God, died on the Cross. Most people would agree that death is stark - but it sometimes is difficult to take sin seriously. Almost, every Christian has the tendency to think - "Gee God, does this behavior really need to change? After all, I am a pretty good guy." Yet, there really is something quite broken inside us, something that really needs to change, and by ourselves we do not have the strength to change it. We need God, not as an escape or distraction, but as the only One who can help us deal with who we really are. And this is where Unamuno's priest, as compassionate as he is, is really unable to help people. Unlike the Unamuno's Christianity which preserves a social order and a pleasant country existence, true Christianity seeks to transform the heart and save the whole world. The ministry of the priest must constantly deal with the relentlessy real - it does not have the luxury of sustaining pious myths. The purpose of this reflection was to shed some light on the curious tension in the priestly ministry of St. John Vianney and his own feelings of unworthiness. Unamuno's character really captures something of the priestly heart when it comes to the compassion that the priesthood demands. A priest is asked to bear all the sorrows of the people entrusted to him, and a huge part of his ministry to console those who feel overwhelmed. Unlike St. Emmanuel the Good, however, the Curé d’Ars really did believe the Gospel. The love of God was not a story he promoted so that people could endure their meaningless lives. St. John Vianney understood that each and every life has a deep and eternal meaning, even if he was anxious about what this meant for himself. In the face of his own feelings of unworthiness, the priesthood enabled him to help those entrusted to him find this meaning for their lives. They discovered through his ministry that they were truly loved in the most unimaginable way. And once they found that meaning, they could not possibly go back to the way they lived before: everything changed. Many of his parishioners devoted their lives in wonderful ways to living for the glory of God. In our last post, we considered a particular problem which the witness of the Cure d'Ars suggests. The priest signifies something for us - and not just for us Catholics, but for the whole world. But what he signifies is disproportionate to his person. His existence points to Christ, under a specific aspect. While all the baptized participate in the mystery of Christ, the priest, in fact, participates in a unique way. But what distinguishes the priest's participation in the mystery of Christ from every other form of participation? In this post, we will try to identify what is unique to the priesthood. In particular, we will see that the priest shares not only in the priesthood of Christ in a unique way, but also in the mystery of Christ as victim. In Christ, and in the vocation of the priesthood, the work of sanctification (i.e. the ministry of making the Church holy) involves a special kind of self-offering. Whatever it is, it is difficult to be faithful to. Even the Cure d'Ars struggled with this. In our last post, we considered how almost all his peers and superiors viewed him as incompetent. Some held him as too incompetent to be a priest. This was not for lack of intelligence. But it did have a lot to do with his own insecurities over his very late and very poor education. Yet if we stop here, we do not really fully see why the John Vianney struggled with a lack of confidence and why this lack of confidence was so great that he actually attempted to forsake his parish ministry on occasion. Here, we are going to consider a mystery that is at the heart of the priesthood for every man who tries to live it out to the full -- this feeling of unworthiness. John Vianney was very concerned about his own salvation. Even as his efforts as a pastor met with great success, he had to fight back thoughts that perhaps he was decieving himself concerning where he really stood with God. Some of this self-doubt may have been brought on by his peers and teachers. Some of it also seems to have come from God. In fact, after he was made pastor of Ars, he asked the Lord to allow him to see the truth about himself. And even great saints can find the truth overwhelming. The reason for this is that our hearts are filled with every kind of misery and weakness. This does not mean we are completely evil. But it means that what is good, noble and true about each of us needs to be saved – and only God can save it if we let Him. He never imposes Himself, but patiently deals with the darkness we suffer as we are ready and willing. This is why there are deep wounds that the Lord, in his mercy, does not allow us to see all at once. Otherwise, the magnitude of our brokenness can overwhelm us, and we despair. So normally God allows us just a tiny peak of what he is suffering with us and in us. When He gives us this glimpse, it is only to move us to trust Him and cling to Him all the more. For the fact is, we are powerless to deal with the pain we carry within. And, God never intended that we should try to deal with it by ourselves. He yearns to deal with it - but to do this, as we have already mentioned, we must surrender to Him. In the case of the Curé of Ars, God wanted John Vianney to rely on Him alone - so the Lord showed him something about himself to completely humble him. And it did. The unfortunate side-effect of this vision was that John Vianney struggled off and on with the desire to run off to a more austere form of religious life, and there in hidden anonymity to work out his salvation. He was afraid, in the effort to help others find salvation, he was taking the time he needed to fully surrender himself to the Lord. It is here that we find a great mystery of the spiritual life that applies to everyone. When the Lord gives us a great work, He also gives a great grace - not only for the edification of others, but also for our own salvation. God is always more generous with those who are generous to Him. 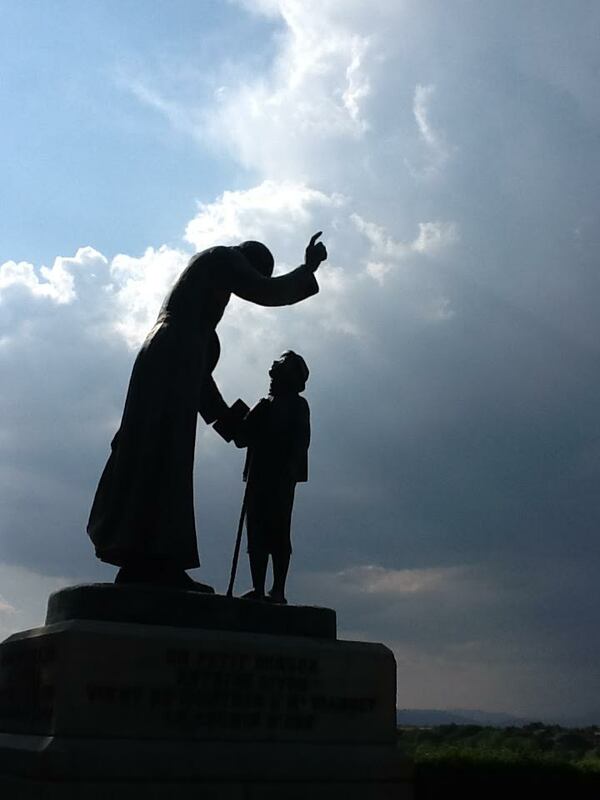 Although John Vianney would run away on occasion, God always brought him back. The Curé was almost oblivious to the grace of God at work in him because he could only see his brokenness. The Lord however sent his parishioners and friends to intercept him before he got too far. It was through others, through those he ministered to, that the priest of Ars slowly accepted that God was sanctifying him, not despite his priestly ministry, but because of it. John Vianney learned to accept his unworthiness as an integral part of the mystery his vocation signified. So, what is it the priest signifies? What is the reality to which his very person now points because he has been joined to the office of the priesthood? Fulton Sheen suggests a secondary meaning of Christ’s word’s “This is my Body” sheds light on this question. When the priest says the words of consecration, not only is bread and wine changed into the Body and Blood of Christ, the priest is also identifying himself with Christ in a sacramental way: He is a visible sign of an invisible reality, and that reality is Christ crucified. He is, after all, saying, “This is my Body.” Bishop Sheen suggests that we see at every mass what the person of the priest is become through Holy Orders a “priest-victim” who signifies Christ himself. But now we get to what is perhaps the oddest part of this exploration. The priest is supposed to signify Christ, the Priest-Victim, whose perfect sacrifice has saved us from sin and death. In most cases, however, there seems to be very little of Christ’s perfection in the priest’s own personality. Not only do others see this - but the priest himself suffers it. Most priests experience something like John Vianney: they feel unworthy to point to Christ and at the same time, feel compelled to offer themselves as a sign of Christ for others. So what is it in the grace of Holy Orders that allows us to find Christ crucified in the priest? In order to answer this question, we will consider literary examples of the priesthood provided by Miguel de Unamuno and Graham Greene in our next post.